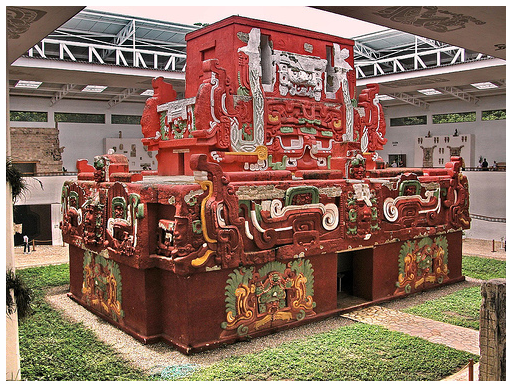 One of the most impressive projects completed by the Copán Association has been the Copan Sculpture Museum. The Copan Association’s early years were spent rescuing sculpture from Copan, raising the necessary funds to build this enormous, yet subtle edifice, and finally managing the design and construction as it took form. We are very proud of our role in the creation of this important Central American Museum. There were many challenges presented with the design of this important museum. It needed to be close to, but not intrusive, to the UNESCO World Heritage archaeological site of Copan. Since electricity is inconsistent in Copan, it needed to make use of natural lighting and ventilation by being open to the elements, while at the same time give sufficient protection to the precious, ancient sculpture. It needed to be large enough to include thousands of sculptures and fully reconstructed buildings, and at the same time blend into the landscape. Archaeologists William Fash and Ricardo Agurcia, artist Barbara Fash, architect Angela Stassano and conservationist Rudy Larios worked together to realize this challenging vision. So that this gigantic museum does not interrupt the visual landscape of the site, the majority of the structure is underground, covered by an embankment of trees. Visitors enter stylized jaws of the mythical serpent used by the Maya rulers to communicate with their dead ancestors. Following the 50-meter long tunnel that represents the body of the serpent, they are symbolically transported into the past. The visitor is then delivered into an enormous courtyard dominated by the vibrant, full-scale and full-color replica of Rosalila. The museum has 4,000 square meters of floor space and two stories of remarkable Copan sculpture. An open central skylight allows for ventilation. Around the Rosalila replica, exhibit designer Barbara Fash mounted 59 exhibits of more than 3,000 pieces of sculpture, the majority of which are installed on the facades of six fully reconstructed buildings. This dramatic museum is also home to three of the most precious original stelae of Copán (Stela A, Stela P and Stela 2) as well as the original, renowned Altar Q. The Copán Association raised funds to ensure the completion of the project, and the President of Honduras, Rafael Leonardo Callejas (1990-1994) was most generous in making this museum a reality. The Copan Sculpture Museum is open during the same hours as the Archaeological Park: every day of the year 8:00 a.m. to 4:00 p.m.